Now is a good time to validate your Azure skills! I've been developing with Azure for a while and this week I made the jump into passing my first Azure certification with Exam 70-532 in order to validate my skills. I scheduled an online proctored exam and after two and an half hours I successfully passed the exam at the first shot! The pool of questions is very large and case studies were interesting. Yes as often there are some tricky questions but overall it has been a great way to validate my knowledge. Also if you jumped on the Azure train late and never had the opportunity to work with Cloud Services such as Web Role or Worker Role this want prevent you from passing this exam. As Azure is evolving every day, the exam was updated recently to reflect the new services. To maximize your chances I would advise you to at least know and understand Cloud Services. The current Azure certification offer is really interesting if you want to pass any of the following exam: 70-473, 70-475, 70-532, 70-533 and 70-534. Considering that a single exam itself is usually USD $165, this offer valid until 6/30/2017 is great if you want to validate your Azure skills! 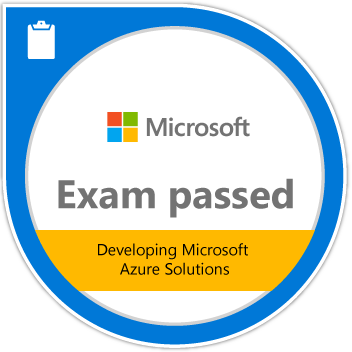 It's always rewarding to get an exam, receive a badge and I encourage you to go ahead in validating your Azure knowledge. Please feel free to comment or contact me if you have any question. Of course don't ask me about to the content of the exam, as you know Non-Disclosure Agreement apply for Microsoft Certification Exams. Any pointers to study resources that you used? Or did you just google for each of the points in the Exam objectives and read from documentation and blogs? During your exam, did you encounter a lot of powershell arm and classic style ? Any cli?